Make sure you get all your coupons printed today! It’s the end of the month and many coupons will disappear while others will reset. 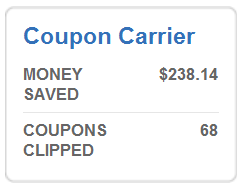 I recommend printing your coupons in groups of three to avoid paper waste and printing in black and white. I have never had a problem with a coupon not being accepted because it was not in color. You can also try setting the print quality to draft, although you can sometimes run into issues with the coupon not scanning. And finally, it doesn’t matter what is on the back of the coupon, so you can re-use paper that is clean on one side!